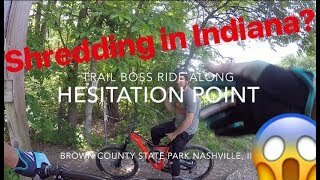 Please don't ride the trails when they're wet. Riding hours are from 7:00am until 11:00pm. Yield to hikers and uphill riders. This ride has flow and tons of it. Beginning at the North Gate Trailhead, this ride covers most of the beginner and intermediate trails at the northern end of the trail system. These trails have intermediate elevation changes and abound with flowy downhill sections that are nothing if not loads of fun. Once you reach the bottom of the Hesitation Point Connector, the work begins. You might want to take a breather at the small rest area near the frog pond. There's even a tree with a branch that serves as a convenient makeshift workstand for many riders in need of an adjustment. You'll have the monster climb up to the top of Hesitation Point, followed by Walnut Trail. As an expert option, you can hit Schooner on your way out. You'll get a bit of a break on Limekiln with some smoother trail and more flow, and then you'll be back to work on Walnut climbing back to Hesitation Point. Most of the work is done by this point, and you can enjoy the descent off Hesitation Point and the most direct route back to the North Gate Trailhead. This ride will push the limits of your endurance and technical skill. Make sure your bike is in tip top shape, and pack plenty of water and some food. In the heat of summer, it's a good idea to carry some electrolytes, too. Enjoy the experience while you're here. After your ride, pay a visit to one of the many wineries or breweries. There are at least 10 wineries, many of which are included in the Indiana Uplands Wine Trail. The list of breweries is equally long, and getting longer. The nearest is Big Woods Brewery in Nashville. Also of note is Upland Brewing in Bloomington, famous for its fruit lambics. There are other breweries in Bloomington and Columbus, so check up with who's new on the scene when you visit. Nashville is also home to a great shopping district with many arts and crafts. Intersections on this trail system are numbered, and the route for this ride can be followed simply by connecting the numbers. Starting at the North Gate Trailhead, follow Pine Loop for a warmup to Intersection 1 at the North Gate Connector. Head South on North Gate and enjoy the flow to Intersection 2 with North Tower Loop. Head clockwise (that would be a left turn) on North Tower and lose yourself in the swoopy, twisty trail to Intersection 4 and then continue to Intersection 3 with the Green Valley Trail. Follow Green Valley and reach Intersection 6 with Aynes Loop. Green Valley steps up the technicality and climbing a notch, so be ready. Head clockwise on Aynes Loop to Intersection 5, turn right, and follow Aynes to Intersection 7. Before you start climbing, enjoy the rest stop at the old CCC shelter ruins. You also might want to take advantage of the rest stops at the tops of the big climbs on Aynes. Here, head South on the Hesitation Point Connector to Intersection 8 at the top of Hesitation Point Trail and the intersection with Walnut Trail. This climb will probably take you a good 45 minutes. It's quite a grinder, so be prepared. If your bike needs some tweaking, use the "repair stand" and your multitool to make the necessary adjustments because the big challenge begins here. Taking a breather at the top of Hesitation Point and enjoying one of the best views in the state is probably a good idea before setting out on Walnut. Follow Walnut Trail to Intersection 9, then Intersection 10, then to Intersection 11 with Limekiln Trail. Walnut will test your skills and fitness, so be ready for it. The trail starts to get quite rocky here. It's not as gnarly as Schooner, though, which is an option for riders with balls of titanium. Follow Limekiln Trail to the Rally Camp Parking lot, and then backtrack. Limekiln will give you a much-needed breather after riding the more technical parts of the trail, and help get you ready for the climb up Walnut. To return to the parking lot, simply count down the intersection numbers in order. Reach intersection 11 with Walnut, pass Intersection 10, 9, 8, and 7 with Aynes Loop. Follow Aynes clockwise to Intersection 6 and then Intersection 5. At Intersection 5, turn left and reach Intersection 4 with North Tower Loop. Follow North Tower clockwise and pass Intersection 3. At intersection 2, turn onto the North Gate Connector and pass Intersection 1 to return to the North Gate Parking lot. The return route isn't too tough, which is a good thing because you're probably pretty wiped from riding the more difficult trails in the park. 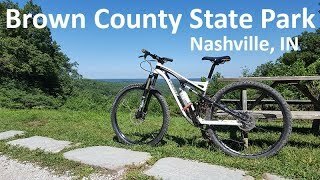 After your ride, find something fun to do outside the park in Nashville, Bloomington, or Columbus. This park has a lot of evidence of Civilian Conservation Corps activity. Keep your eyes peeled and take some photos of the old structures. 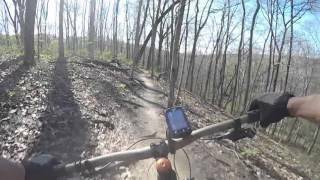 These are some of the best trails in the area. The park is clean, the trails are well marked and groomed. Rode Bobcat on the way back instead of Walnut/Hesitation. First time here, and MAN was it a blast! Mtb on our way home from Mo and Cody's wedding. J crosses rustic skinny on Hesitation Point Trail. Log skinny on North Tower Loop. Log over practice on Pine.